Journal of Environmental Biology is a broad-based, peer-reviewed International Journal that publishes original research papers and research reviews (with prior permission) from all areas of Environmental Biology. Journal is published bimonthly with six issues in a year– January, March, May, July, September and November. Authors are advised to read carefully the “Guidelines for Authors” for preparing the manuscripts (MS) to become familiar with the style and format of the Journal of Environmental Biology (JEB). Manuscript not prepared and submitted as per Guidelines will not be considered for publication. v All the manuscripts published in the Journal are reviewed by a group of reviewers / referees for their scientific merit. Journal follows dual blind review system and the decisions are solely based on the results of peer review. v Authors will be notified of acceptance, need for revision or re-revision or rejection. Once rejected that manuscript can not be resubmitted. Editor-in-chief reserves the right of rejection at any stage without assigning the reason. v Rapid Publication Facility (RPF) and Technical Language Editing Facility (TLEF) are also available to authors. The research manuscripts published in the Journal will be automatically considered for International Cash Prize US$ 500 every year, if the filled in Author Certification Proforma is sent along with the manuscript. Journal of Environmental Biology publishes original research manuscripts dealing with all aspects of Environmental Sciences, Environmental Pollution, Environmental Biotechnology, Microbiology & Biochemistry, Toxicology, Agricultural Sciences including Forestry and Fish & Fisheries— in English language. Scientists who use English as a foreign language are strongly recommended to have their manuscripts (MS) checked by a native English proficient colleague or English Editing Services for linguistic correctness before submission. Original Research Article: It should be original consisting 4000 to 6000 words with at least 25 references and Text / content subdivided into Introduction, Materials and Methods, Results and Discussion, Acknowledgment and References. Review Article: It should be authored by experts in the field with prior permission from editor, should contain 6000 to 8000 words with at least 75 references including 15% of authors and text / content subdivided into Introduction, Subheadings and References. Short Communication: It should be of 3000 to 4000 words with at least 8 references representing significance of results of exceptional interest. All research papers published in the Journal of Environmental Biology are available online immediately after publication of print version. Free of charge download PDF of published paper from website: www.jeb.co.in. (iv) it has been approved by all the authors and the concerned institutions. Journal of Environmental Biology may consider publication of Supplement or Special Issue based on proceedings' research manuscripts and reviews (National & International Conferences). Manuscript should be computer typed in double spacing on one side of A4 size white paper, leaving wide margins on both sides. (a) Use standard symbols of Units conforming to the International System of Units (SI). Some examples are: km, m, cm, mm, µm, Å, nm; kg, g, mg, µg, mol (mole); l (liter), ml (milliliter), µl (micro liter); yr (year), wk (weak), d (day), hr (hour), min (minute), sec (second), µs (microsecond); ppm (parts per million), ºC (centigrade), SD (standard deviation), SE (standard error), CV (coefficient of variation); sc (subcutaneous), ip (intra- peritoneal), iv (intravenous); mg l-1 (milligram per liter), ms-1 (meter per second), g l-1 (grams per liter), ha (hectare). For enzymes, use trivial names as recommended by IUPAC-IUB Commission. b) Tables should be typed in Microsoft-Word Table format on separate pages, and should be numbered using Arabic numerals. They should be supplied with headings and should be referred to as “Table 1, 2, …”. (c) Figures: Only clear and original figures & photographs of high contrast will be considered. Figures of all kinds should be prepared by Coral Draw / EPS software as vector-based files. Do not send figure-files which lack clarity. E To maintain high print - quality of figures, authors should follow guidelines given below strictly, if not as per Guidelines, the publication of paper is likely to be delayed. ¬ The figure width should be 8 cm OR 16 cm and height should not exceed 23 cm with the screen resolution of 300-600 dpi in JPEG or TIFF format. Scanned line figures and images should be of minimum resolution 800 dpi and for halftone 300 dpi is ok. If figures are assembled, a line or space should demarcate the border between the two original figures. ¬ Symbols and lettering size should be of 9 point in Arial Narrow. Use metric units as specified in “Authoring Guidelines” available on our website: www.jeb.co.in. The axis of the graph should be 0.5 point or 1.0 point. Avoid use of hairlines & screen shading, instead use black & white, hatched and cross hatched patterns for distinctness. Do not draw figures with hairlines. Overlapping of the symbols and data should be avoided. Avoid variations in font size in a single figure. ¬ Use Cyan, Magenta, Yellow & Black (CMYK) colors rather than Red, Green or Blue (RGB) for color figures. Capitalize the first letter in label only, not every word. Use zero before a decimal number e.g. 0.3, 0.55 etc. Multipart figures should be labeled as A, B, C, D, …… and positioned at the upper left hand corner of each figure part. 1. Title of the manuscript: Descriptive but concise. It should not exceed two lines in print. No number and abbreviations should be included. Do not use Capital letters. 2. Author(s) name(s): The names should be in the following order, initials of first and middle names and then surname (family name). e.g. R. C. Dalela. Check that all names are spelled correctly. Mark the corresponding author with star (*). Do not write names in capital letters. E “Author Certification Proforma” duly filled in should be submitted with manuscript, necessary for International Cash Prize US$ 500 for Best Paper Published in a year. (e) Page 2 should contain Title of the manuscript, followed by Graphical abstract and Key words. To facilitate the review process, there should be no name(s) and address(es) of the author(s) on this and the subsequent pages of the Text. Aim: 2-3 lines of introductory sentences that would explain topic, objective and research question(s). Methodology: 2-3 sentences describing research methods used. Results: 2-3 sentences mentioning significant findings. Interpretation: 2-3 sentences stating conclusion, recommendation and relevance of the study. Key words: Author should select 4-5 relevant Key words from the text that would serve as subject index as well. They should be arranged alphabetically. Keywords would be used for indexing purpose. ii) Graphic Figure : The graphic figure of abstract should be a single and pictorial depiction of the main findings of the paper. It should be designed to help the readers to capture significant findings of the study without reading the entire text. ¬ Size: The size would be 8X8 cm OR 8X16 cm (height & width) with the screen resolution of 300 dpi in JPEG or TIFF format. ¬ Font: Arial narrow-9 point. ¬ Preferred figure type: Coral draw maximum X5. Do not use capital letters for headlines. All scientific names, from the level of genus downward, should be made italics (e.g. Rattus rattus). Introduction should precisely include the aim / objective of the study. It should be concise and specific with no sub-headings. Reviewing of literature should be avoided. Materials and Methods should be sufficiently detailed to enable the experiments to be reproduced. The standard techniques and methodology adopted should be supported with references. Results and Discussion should be combined. Results may be split into sub-headings. Results should be co-related and discussed. Data emerging out from the study should be included, arranged in a unified and coherent sequence, and statistically analyzed with significance. Position of Figures and Tables should be indicated in the left margin of Text. The same data should not be presented in Tabular and Graphic forms both. Lengthy, confusing and irrelevant discussion should be scrupulously avoided. It should deal with interpretations and the conclusions drawn, based on results and supported by relevant latest references. Repetitions should be curtailed. It should be ensured that the references cited should be current. Unpublished references should not be included / cited in the manuscript. Acknowledgments should include the names of those who contributed substantially to the work described in the manuscript but do not fulfill the requirements for authorship. It should also include the sponsor or the funding agency of the project of which the manuscript is a part of. References should be cited in the Text by surname of the author(s) and the year of publication e.g. Bucher (2017); Arulmathi and Elangovan (2016). In case of more than two authors, surname of first author followed by et al. and the year of publication should be cited in the text e.g. Anwele et al. (2015). If two or more papers were published by the same author in one year, distinction of these should be made by adding a, b or c -- e.g. Chandra (2010 a, b). In the list of references (Reference section) at the end of the paper, full and complete references should be written as per style and punctuation given below (see box), arranged alphabetically by first author's surname. Be sure that every reference cited in the text must be present in the reference section and vice-versa. Karel, F.B. : Determining the effect of system parameters on ultrasonic water disinfection and enhancing its efficiency with a hybrid application. J. Environ. Biol., 39, 597-602 (2018). Keskin, D. and N.C. Guvensen: Comparative analyses of phytochemical composition and antimicrobial properties of different solvent extracts of Melissa officinalis leaves. J. Environ. Biol., 39, 633-638 (2018). Munoz-Colmenares, M.E., S.S.S. Sarma and S. Nandini: Seasonal variations of rotifers from the high altitude Llano reservoir (State of Mexico, Mexico). J. Environ. Biol., 38, 1171-1181 (2017). APHA: Standard Methods for Examination of Water and Wastewater. 22nd Edn., APHA, AWWA, WPCF, Washington DC, USA (2012). Robert, C. M. and E. Hodgson: Molecular and Biochemical Toxicology. 5th Edn., John Wiley & Sons, Inc., Hoboken, NJ, USA (2017). · The abbreviations et al., idem and ibid should not be used in reference section. · Unpublished research including theses and personal communications should not be cited in the Text and Reference sections. · Footnotes should be avoided. When papers originally published in languages other than English (e.g. Chinese, Turkish, Japanese, Spanish.....) are cited in the text, their references in the Reference section should be translated into English language, along with the original language. While giving the names of the periodicals, standard abbreviations listed in the International Serials Catalogue, published by International Council of Scientific Unions Abstracting Board (ICSUAB) should be used. Even if a reference contains more than two authors, the names of all the authors should be given. Hard copy of the manuscript, Panel of Reviewers and Editor Fee by Bank's Demand Draft (if not sent by Direct transfer) should also be sent by Post. ¬ Acknowledgment of the manuscript will be sent to the Corresponding author by E-mail and a Manuscript Registration Number (MRN) will be assigned. Author should use this number for future communications. ¬ The process of review shall start only after Editor Fee (Registration Fee) is credited to our bank account. ¬ A panel of four potential reviewers (experts of the field) for reviewing the manuscript should be provided on a separate page with their complete contact details including postal address, e-mail ID and telephone numbers. ¬ Materials contained in the Manuscript represent the opinion of the author(s) alone and should not be construed as the opinion of the Editors, Editorial board or of the Publisher. ¬ The manuscript shall be rejected at any stage of publication if found containing plagiarised content. ¬ Addition, deletion or rearrangement of authors name of accepted paper are not allowed. The hard copy of the final revised or re-revised manuscript should exactly match the soft copy sent by e-mail. ¬ Journal is published directly in page set. Authors are, therefore, advised to cite the Figures and Tables on the left margin of the manuscript. ¬ If the manuscript is not revised strictly as per reviewers report / comments or if at the time of Editing visible error is noticed in MS, it may be rejected. Revised or re-revised manuscript is subjected to compliance check in the light of reviewers' reports and final re-check by our R&D division before releasing the acceptance letter. Page-proofs will be sent to the Corresponding author only once for minor corrections and approval. Excessive changes / alterations made in page proofs by authors will be charged as per line reset. Proof reading is the sole responsibility of authors. (a) Editor Fee must accompany each manuscript at the time of first submission. The Editor Fee is Non-Refundable. (b) Page Fee is levied on authors after acceptance of manuscript prior to start of publication. Page Fee invoice will be sent to the corresponding author along with page proofs. Page Fee should be paid immediately after the receipt of the invoice. Corresponding author will receive a PDF reprint (ePrint) of the published paper by E-mail Free of Charge. An extra fee may be applicable to some manuscripts depending on the extensive tables and excessive changes in page proofs. This would be assessed on a case-by-case basis, and the authors would be invoiced for it. · India-based authors should make all payments either in the form of Bank's Demand Draft in favor of: Triveni Enterprises, payable at Lucknow branch or by direct transfer to our Bank Account. · Outside-India authors should make all payments only by direct transfer to our bank account in India. No reprint will be supplied to authors. However, a PDF reprint (ePprint of published paper) will be emailed to the corresponding author free-of-charge. 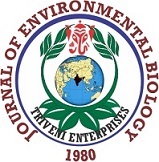 Copyright of all the papers published in Journal of Environmental Biology belongs to Triveni Enterprises, Lucknow, India.